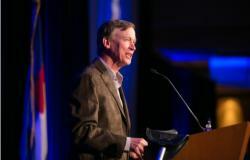 Governor John Hickenlooper opening the 2013 Judicial Excellence for Colorado Dinner. In 2003 CJI created the Judicial Excellence for Colorado Dinner to formally recognize the winners of the Judicial Excellence Awards as well as raise funds to support the Judicial Education Fund. Hosted annually, the dinner is one of only two fundraisers CJI hosts each year. Companies, organizations and firms who sponsor tables at the event receive recognition at the dinner and on the CJI website, and become a member of CJI for one year. CJI also hosts numerous individual guests to the dinner to help celebrate judicial excellence and support our mission of judicial excellence and education. The funds raised at the dinner support the judicial education fund, the Our Courts public education program, and the other activities of CJI. For information on any past Judicial Excellence Dinner please click here or contact Cynthia Ophaug-Johansen at 303-766-7501 or Cynthia@ColoradoJudicialInstitute.org.